The American Research Group is polling all 50 states. All were telephone polls with a MoE of 4%. The first 20 polls were just released. The rest will follow soon. 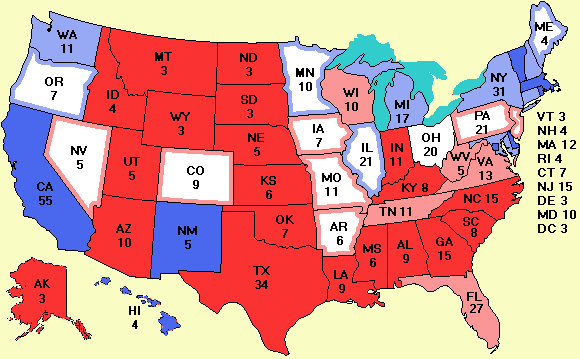 The first batch were mostly the solid blue and solid red states, including the first polls for Nebraska and Wyoming. Bush has commanding leads of 31% and 36%, respectively in those two states. That's why nobody was willing to spend the money to poll them before. The only two states that changed are Maine (was tied, now Kerry by 4%) and Colorado (was Kerry by 1%, now Bush by 1%). The poll also concluded that without Nader, Kerry is leading Bush nationally by 48% by 45% and with Nader by 46% to 45% with Nader at 3%. Among likely voters, it is Kerry 47%, Bush 47%, Nader 3%. The Harris national poll (Sept. 9-13) puts Kerry ahead 48% to 47% and the Pew poll (Sept. 11-14) puts Bush ahead 47% to 46%. In contrast, Gallup (Sept. 13-15) has Bush ahead 55% to 42%. It is not clear why Gallup is contradicting three other polls that say the race is tied nationally. Jimmy Breslin of Newsday had an column yesterday that, if true, makes this website irrelevant. Breslin claims that pollsters do not call the 168 million cell phones in the country. Since many younger voters do not have a land line and just a cell phone, they will be hugely underrepresented in all the telephone polls. Since younger voters lean more towards the Democrats than the average voter, the polls may be greatly underestimating Kerry's strength. Between missing all the people who have only a cell phone and no land line and the 5 million overseas voters, the polls maybe missing a very large section of the electorate. If anyone working for a pollster or telecom company knows ***for sure*** whether pollsters call cell phones, please let me know. But please don't send e-mail on this subject if you are just speculating. And, as has become normal in recent years, the election is being fought over in the Florida courts. No fewer than three courts, including the Florida supreme court, are now involved in the issue of whether the Reform Party actually exists in Florida and thus whether its nominee, Ralph Nader, can appear on the ballot. Nader did not gather signatures in Florida, claiming to be the nominee of the Reform Party, which if not clinically dead, has been in deep hibernation for years. Just in case you have been living on the back side of the moon for the past four years, Bush won Florida in 2000 by 537 votes with 97,421 votes going to Nader. Jeb Bush is doing his utmost to see that Nader appears on the ballot. Perhaps he has come to believe that the extraordinary intensity of the storms Florida has been experiencing for the past few weeks might be related to global warming and he now thinks that Nader will protect the environment better than his brother. Finally, the ads for this site at college newspapers are starting up. The idea is to get younger voters in swing states to pay attention to the election by having them visit this site and hopefully get enthusiastic enough to vote. The following ads have already been ordered. They should appear within a few days. More are in the works. I don't have a good banner ad. If you are a graphic designer and can make a good (animated) 468 x 68 .gif ad, please send it to me. The complete list of where ads are running is giving at the bottom of the donations page.